Oriflame was Founded in 1967 by two brothers. Oriflame is now an international beauty company. Oriflame is present in more than 60 countries worldwide. Watch this beautiful video and listen to the founders of Oriflame. Annual sales exceed €1.3 billion. 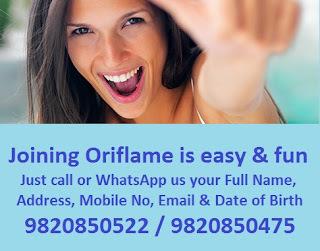 There is a craze about oriflame products in guwahati. The reason for this is the fact that Oriflame products are non gmo certified. So there are no genetically modified products in the ingredients of any skin care product from Oriflame. You might wonder that there are no Oriflame shops in Guwahati then how come they are making such a big business and a huge turnover in Guwahati. When people like certain things for it no matter what. And Oriflame is into a direct selling business model. So we have Oriflame distributors in Guwahati Assam and those you wish to buy Oriflame products get them from dealers in Guwahati. In fact I can so many calls from people who wish to join Oriflame for self consumption and even for business. Business is increasing in Oriflame Guwahati office. More and more people are joining Oriflame and getting success by following my coaching. For joining Oriflame you can also WhatsApp your Full Name, Address, Email, Date of Birth and Mobile no on 9820850522 or 9820850475. You can call me or whatsapp me on 9820850522. About Mrs. Jashmi Mrs. Jashmi is an Oriflame Director. She is also an Oriflame Certified Beauty Expert. In April she received an award for her performance at an Oriflame event in Mumbai.